What sounds more easy as pie than five ingredients, a blender, and a pie shell? A Whole Lemon Pie is exactly what is sounds like. That's right you use a whole lemon - peel, pith, and all. Blend and bake and you're rewarded with a sweet and tart custard-like pie bursting with lemon flavor. NOTE: I like to take the time to macerate my lemon(s), otherwise when baked the pie may taste slightly bitter. I also use two medium lemons instead of the one the recipe calls for. To avoid a "chewy" filling I zest the lemon, trim the ends, skin the white pith, then thinly sliced the lemon, removing all seeds. Repeat with second lemon. I put the lemon slices and zest in a bowl and add 1 1/2 cups of sugar, macerating at room temperature for at least 6 hours (or overnight). If you didn't macerate your lemon (see above) then trim the ends of the lemon. Cut into thin slices and remove the seeds. Add the lemon slices (or macerated lemon sugar mix), butter, salt, sugar (if you macerated the lemons, do not add more sugar), eggs, and vanilla extract into blender or food processor. Blend completely smooth and creamy. Bake for 35-40 minutes, or until the top starts to turn golden. You may need to cover the edges of the pie crust if it starts to brown before the pie is done. Remove from oven and allow to completely cool before slicing. Store pie in the fridge. NOTE: Avoid using large lemons. They typically have a thicker pith which can make your pie too bitter. 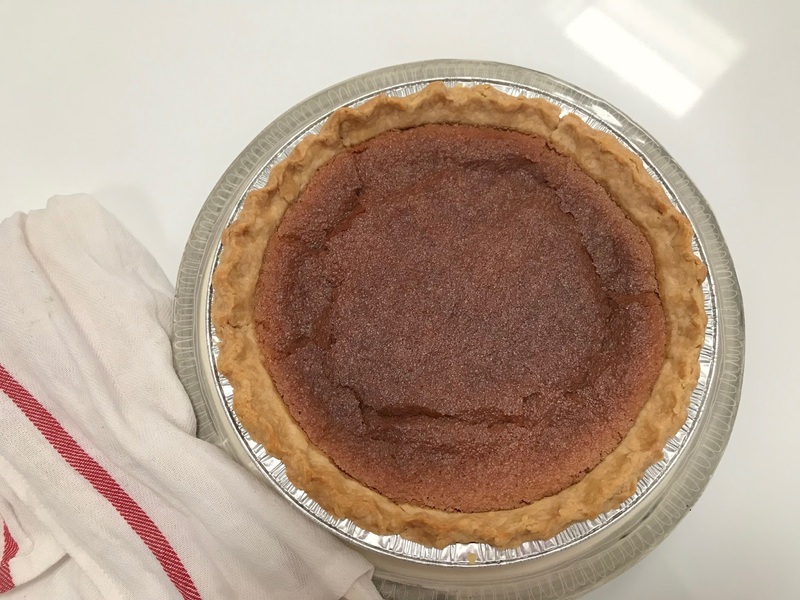 First of all, what is chess pie? You might not be familiar with it if you're not from the South. The simple filling is made from pantry staples of eggs, sugar, butter, and a small amount of flour or cornmeal (or even vinegar) to hold it together. You can change the flavor of this base filling by adding vanilla, lemon juice, nuts, spices, or even chocolate. The variations are limitless. If you're curious about the origin of the name, there's a bit of folklore around the name. 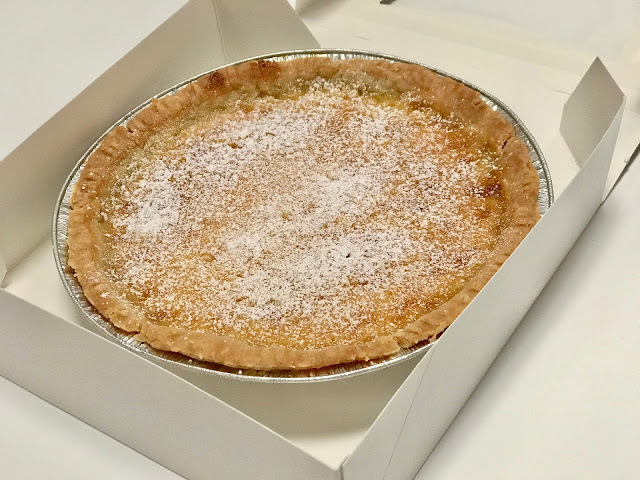 Some believe the word "chess" is an Americanization of the English word "cheese," referring to English Lemon Curd pie (chess pie is a cheese-less cheesecake). Another explanation suggests that "chess" is just a drawn-out drawl for "chest," which is how the very sugary pie had to be stored to keep the flies away (pie chest). And then my favorite is the folklore a plantation cook was asked what she was baking that smelled so good, and she replied, "Jes pie." Whatever the truth, chess pie is a southern staple that must be tried by all. I baked chocolate chess pie that doesn't require a tablespoon of flour or cornmeal, probably because of the cocoa powder. For the crust I used the "stir and roll" Wesson oil recipe I blogged about yesterday. This is one of my favorite pies -- delicious. Pour the filling into an unbaked pie shell. Bake for about 40-45 minutes, or until the filling is set around the edges but slightly jiggles in the center. 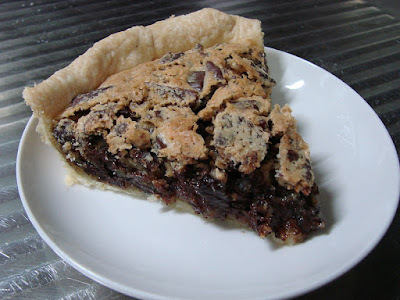 I've experimented with dozens of pie crust recipes over the years. My tried and true method consists of both butter (for flavor) and shortening (for flakiness) for a delicious and tender crust. However, it does take practice and a sure-hand, and even then you're not guaranteed perfect results. I've had years to refine my methods and making pie crust is second-nature to me but I was intrigued when I came across a recipe that was as simple as pour, stir, and roll. 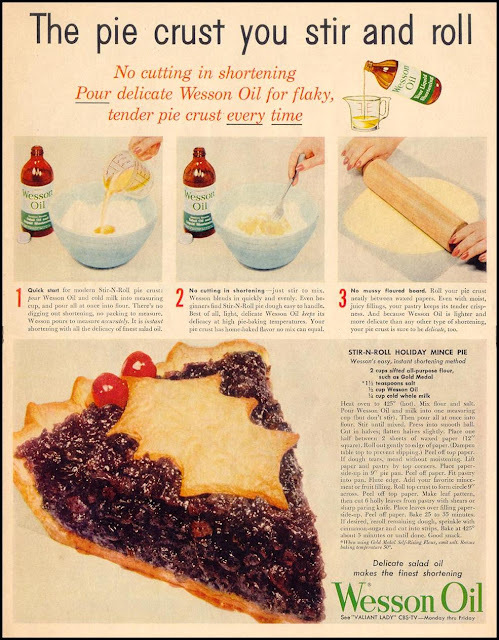 I collect old cookbooks so it wasn't the first time I'd heard of an oil-based crust but it was the first time I was tempted to try it. I didn't think it could possibly compete with traditional crust methods, but the idea of simply "stir and roll" was just too tempting to pass up. The results were mind-boggling; the crust turned out both tasty and flaky. Far from perfect there were downsides, the dough can be difficult to rollout and handle. It wasn't easy to keep in one piece as it kept breaking off. However, it was easily fixed by pressing bits of the dough into the pastry to cover holes in the pan, which you can't really do with traditional crusts, lest over-handle the dough. Also, there was the oiliness. But overall, it's an easy and quick pie crust recipe that doesn't require expensive ingredients, a lot of elbow grease, or rest period for the dough before rolling out. I'd definitely use it for single crust pie recipes. FOR PAR-BAKED CRUST: Preheat oven to 475º F, a very hot oven. In a bowl, start by sifting the flour twice. Whisk in the salt and create a little well in the flour mixture. Pour oil and milk into one measuring cup, but do not stir. Pour into the well of the flour mixture; mix with fork until cleans side of bowl. Finish by gently kneading the dough together into ball, flatten slightly, and place between two pieces of wax paper. Roll out gently until circle reaches edges of paper. Peel off top paper, then pick up pastry and bottom paper by one edge (they will cling together). Place, paper-side up, over pie pan. Then loosen pastry at edges and carefully peel off paper. Ease pastry snugly into place. Finish edge as desired. FOR PAR-BAKED CRUST: prick bottom and side thoroughly with fork. Bake on lower rack in pre-heated oven 8-10 minutes, until golden brown. Follow single crust directions for mixing. Round up dough. Divide in half, flatten slightly. Roll out halves between pieces of waxed paper (as above). Line pie pan with bottom crust, fill, cover with top crust. Seal by pressing edges gently with fork, or fluting. Snip 3 or 4 small slits near center. Bake pies, such as apple, in pre-heated hot oven, 425º F, for 40-45 minutes. 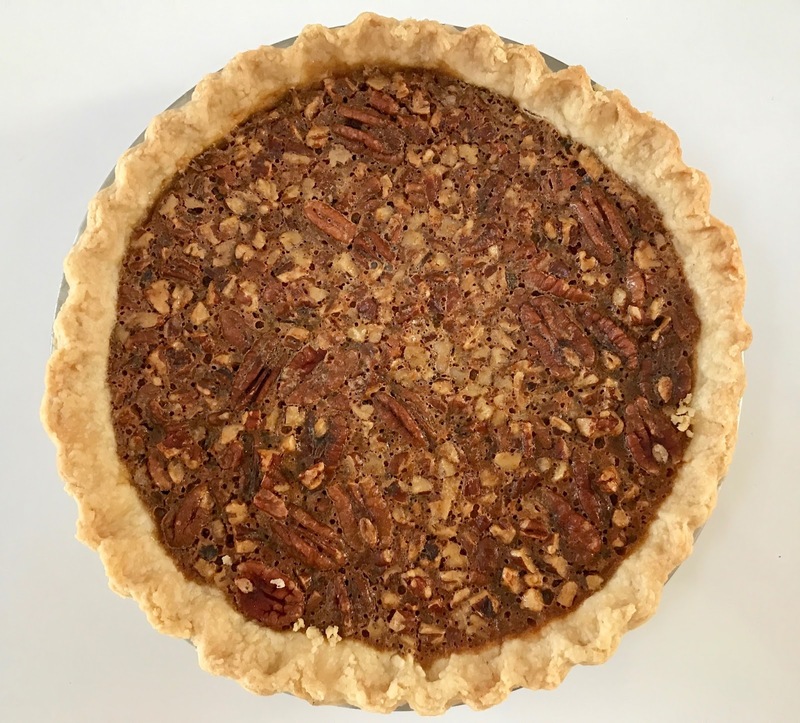 Most pecan pie recipes call for Karo corn syrup which results in an overly sweet, artificial-tasting pie that bears little resemblance to their 19th-century inspiration. Cook's Country wanted to create a traditional pecan pie without using modern day, processed corn syrup and after much trial and error, experimenting with a host of traditional syrups (cane, sorghum), they discovered that a combination of maple syrup with brown sugar and molasses replicated the flavor profile of old-fashioned pecan pies. To ensure the bottom crust was crisp and golden brown, they started the pie at a high temperature then dropped it down to finish cooking. An addition of cream yielded a welcome custardy transformation to the filling. This also made the filling looser, a problem easily solved by adding extra egg yolks. To finish off the recipe, they found toasting the nuts before they went into the pie gave them enough crunch and flavor to hold their own in the filling. Here's the recipe. Make Filling: adjust oven rack to lowest position and heat oven to 450º F. Heat sugar, syrup, cream, and molasses in saucepan over medium heat, stirring occasionally, until sugar dissolves, about 3 minutes. Remove from heat and let cool 5 minutes. Whisk butter and salt into syrup mixture until combined. Whisk in egg yolks until incorporated. Bake Pie: Scatter pecans in a pie shell. Carefully pour filling over. Place pie in hot oven and immediately reduce oven temperature to 324º F. Bake until filling is set and center jiggles slightly when pie is shaken, 45 to 60 minutes. Cool pie on rack for 1 hour, then refrigerate until set, about 3 hours and up to 1 day. Bring to room temperature before serving.